In my previous post, I addressed a serious situation and left off with mixed feelings about the Sierra. 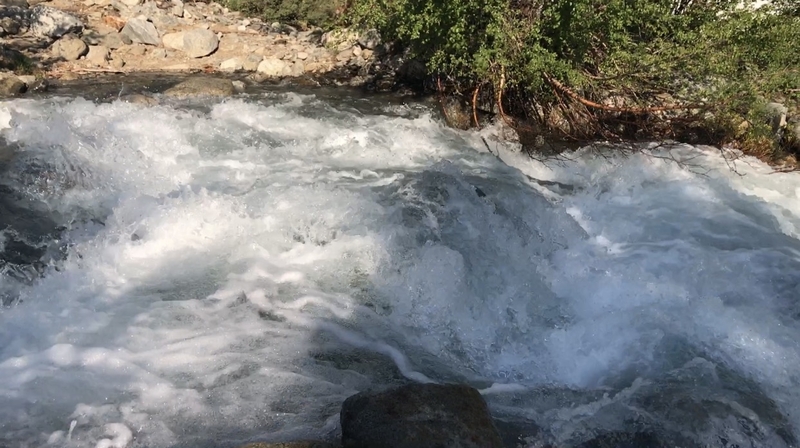 I was about to cross a dangerous creek before heading up to Mather Pass, and began to reevaluate how I would choose to continue north. Since I will only have service for a limited time, I am publishing two posts in a row, with this being the second. If you haven’t read the first, it may make more sense to go back and read that first. So where was I? Oh right, camping along White Fork Creek. I woke up, surrounded by five other hikers who were also attempting to cross. Henri showed up across the way and helped direct us from the north side. In short, we crossed in groups of 3. This is probably because I was so unstable as the third person in that I felt (yelled) that maybe it’d be a better idea. We all decided to link arms but when it came down to it, just held hands. This strategy definitely provided less physical support, but lots of reassurance. After making it across safely, we hiked .3 miles to a campsite where we all dried off, ate breakfast, and finally introduced ourselves. See, I didn’t even know these people, yet I had experienced an unexplainable sense of trust and teamwork in the matter of a few minutes. Their names are Larry, Cosmo, Ya ya and Utah Aaron. Happy Baby, who we have been hiking with for a while, was there with us, too. I wondered if I’d even get to know them well. They seem awesome but I still had in my head that I may get off trail at the next junction. I talked it out with Henri that day. I was frustrated with having to vocalize the way I felt, especially when I wasn’t sure if it was what I really wanted. 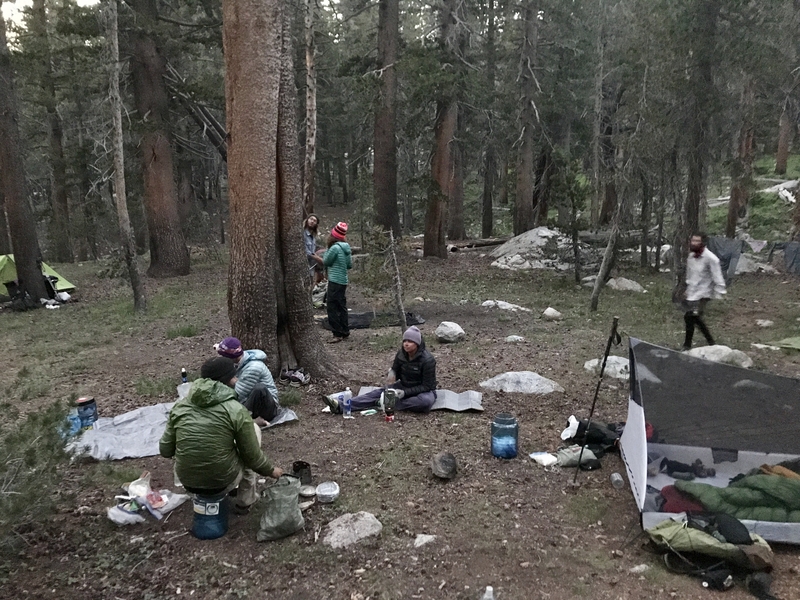 That night, we camped with the group that we just met and set ourselves up for Mather Pass the next morning. Mather is known to be the most dangerous and fear-enduring pass, especially for those afraid of heights, and no option of skipping it. We approached the pass, all 7 of us. We put on our spikes and took out our ice axes. We started climbing. Up we go. One foot in front of the other. Not looking down. The usual strategy. Three points of contact on the mountain at all times. I was third in our little single file row. I approached a spot that looked like someone postholed. The two in front of me went around it, but the only way to do so was to go further onto the edge of the snowy mountain and look down. I took a different approach- to step over the hole instead. When I put my weight on my foot, my entire leg fell into the mountain. I was stuck. I looked into the smaller hole and realized it was not a posthole at all, but instead a void in the mountain. A hole that had no snow under it. A hole that I was half way into and couldn’t even tell how far I would fall if I kept going. We were walking on snow with nothing beneath it. I yelled out to the group. I had to make a move, so I rolled back on what seemed to have been the most solid part of trail a few steps behind where I fell in. Ice axe in hand, trying not to fall off the edge of the foot-wide trail, I somehow managed to roll over my pack and stand back up. Because I rolled backwards, I had to attempt this same obstacle again. This time, with an extra hole to fall into and my legs trembling uncontrollably with the awareness of the potential danger. I took the edge of the mountain route this time and made it over. Twenty feet later, I reached a break in the rocks where I tossed my pack off, continued to shake, and started to cry. Now my only thought was the four behind me. I created a terribly dangerous situation for the group. I couldn’t bare the thought of it. 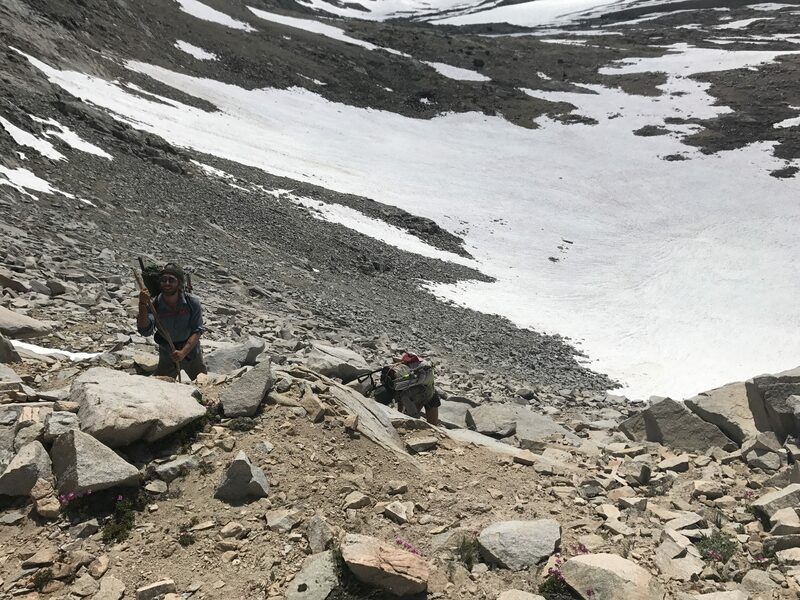 We made it to the sheer rock scramble and made it to the top of the pass. Sure, there were a few miles of snow downhill ahead of us, but this calls for celebration. In the couple of days following Woods Creek and Mather Pass, another beautiful soul (appropriately named Soul Shine) joined our little trail family and has been the best trail angel hiker I’ve met. She’s given me food when I was low, sunglasses when mine broke, and just yesterday pulled out oreos, graham crackers, and funfetti icing to share around the campfire. I truly feel like I received a great trail family when I needed it most. As a collective whole, these individual hikers have helped me immensely through the past 5 days, even if they don’t know it. My attitude, outlook, and strength has been getting better with each mile and each unnecessarily long break. In fact, I can happily say that I will be pushing on through the Sierras. I am still keeping the option of skipping and flipping open if needed, because that’s the part of learning to listen to myself that I wish to hold onto.. But I’m also holding onto these new friendships, the love of my life, and one huge goal. Sounds as if you were totally unprepared for travel on snow and ice. 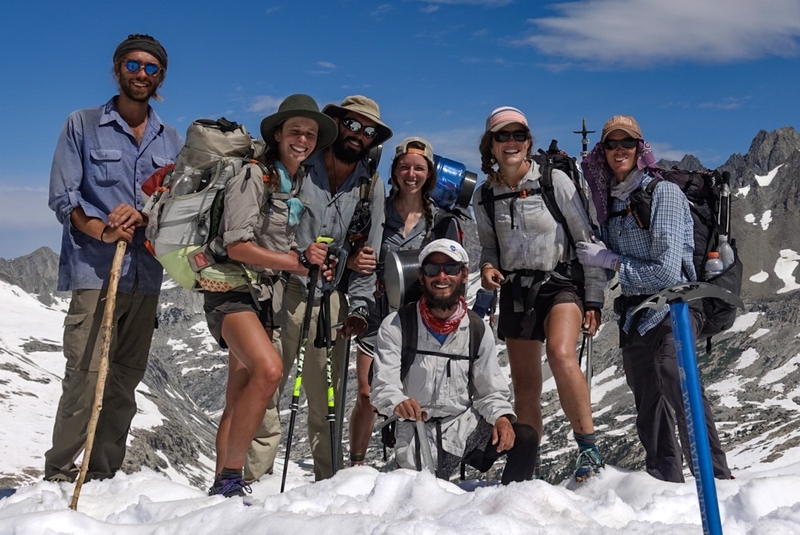 Suggest a short course on winter travel that should increase your confidence and skills, which will prepare you to take situations like you encountered on Mather Pass without fear, trepitation, or tears and turn it into a rewarding adventure. In fairness, even with preparation and experience things can get hairy. I just got off the trail and everyone we talked to shared some of these same experiences. I’m experienced and I still have fears–which also means I never take anything for granted no matter the training I’ve had. You’re stories are eye opening and inspirational!!! Happy trails to you!! Thank you so much for your feedback in the Guthook app! We read it before crossing white fork creek a couple days ago. It was still gnarly 3 weeks after you did it. 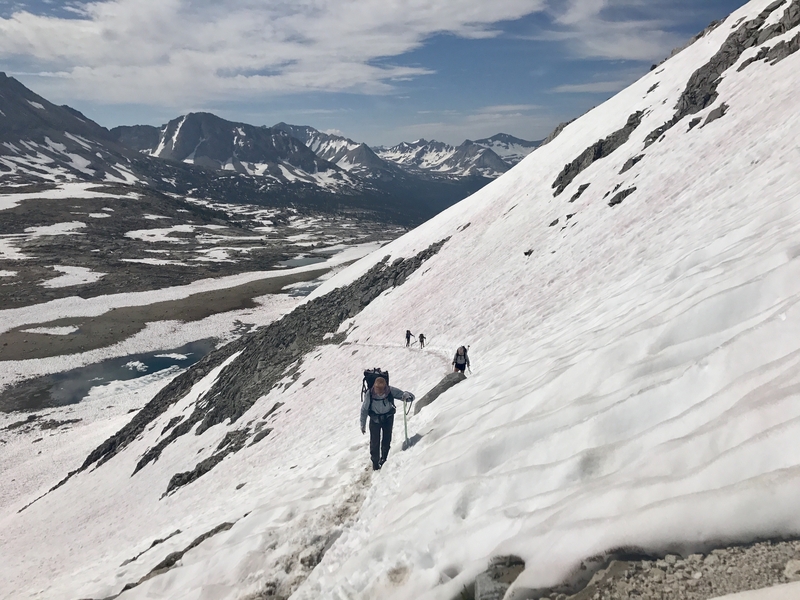 Btw, that and Mather were the scariest things I’ve encountered on the JMT and you actually do sound prepared… I was terrified and I’m experienced.